The FY 2016 budget did not work, and it’s already clear that FY 2017 will not work either. Mid-fiscal year budget cuts are quite likely ahead. It’s the same problem that has existed since unaffordable income tax cuts were implemented. Kansas does not have nearly enough revenue to pay even a constrained set of bills. We’re broke. But the official version will not hold! 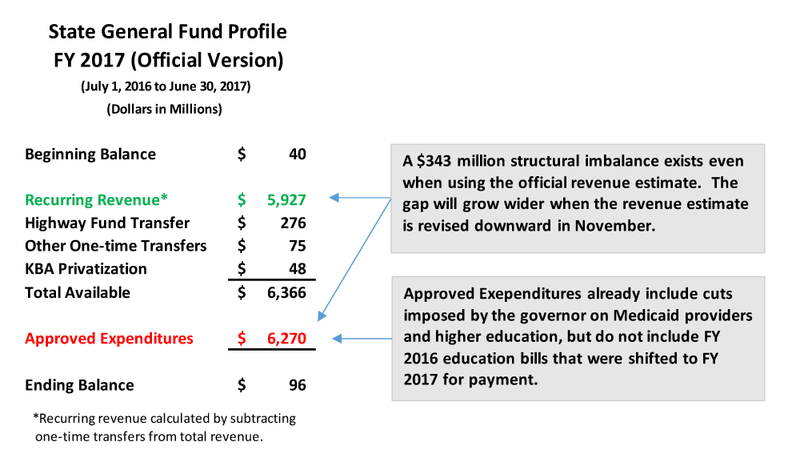 The imbalance between revenue and expense will grow, and the ending balance will go negative without more budget cuts or other remedial action. First of all, the official version assumes a beginning balance of $40 million. That did not happen. Rather, the state had to stop paying bills at the end of FY 2016 in order to keep the general fund balance just above zero. Second and most important, the estimate of recurring revenue in the official version comes from the April Consensus Revenue Estimate (CRE). We now know that the April CRE overestimated FY 2016 tax revenue by $106 million, which means the FY 2017 estimate will almost certainly be revised downward when the forecasting group meets in November. Revenue was already short by $15 million in the first month of FY 2017. 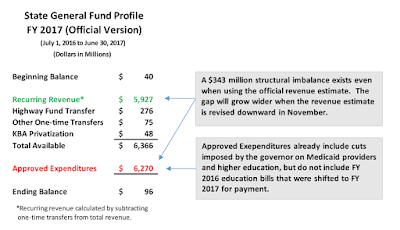 If the FY 2017 revenue assumption is lowered by $106 million to match what happened in FY 2016, the general fund will immediately be insolvent, triggering more expenditure cuts. Third, the official version counts on one-time income of $48 million from the privatization or sale of the Kansas Bioscience Authority (KBA). Quite likely that figure is overly optimistic. On top of all that, the state pushed payment of $75 million of school finance bills from FY 2016 into FY 2017 in order to get out of FY 2016. That expenditure shift does not show up in the official version, but if it did, the expenditure total would be $75 million higher. How will that $75 million be dealt with? We don’t know, maybe through more cuts, or maybe $75 million in FY 2017 bills will be pushed to FY 2018. Remember, the state also deferred $96 million in KPERS payments to get out of FY 2016 and promised to pay those bills in FY 2018 with interest. 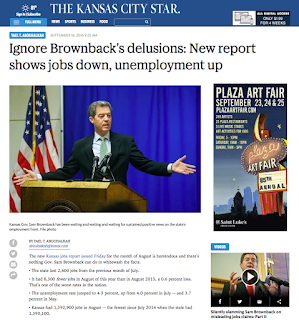 Kansas lives on the financial edge, unable to move confidently into the future. Income tax cuts caused this. When lawmakers convene in January, they must build a budget for FY 2018, but without changes in tax policy, it too is destined to fail.